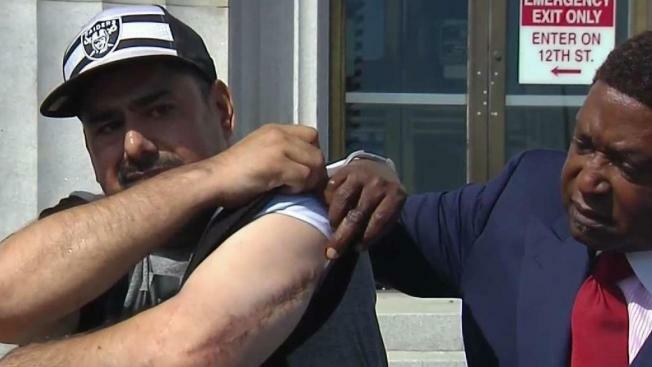 The Alameda County Sheriff's Office and four current and former deputies were sued Monday by a former jail inmate who alleges that the deputies allowed another inmate to spray him with urine and feces multiple times and then broke his arm. "These particular officers were sadists," the inmate, Fernando Miguel Soria, said during a news conference Tuesday in Oakland. "They're not playing with a full deck." Soria says the deputies repeatedly facilitated another inmate spraying him with urine and feces, a practice commonly known in jails and prisons as "gassing," but more frequently is directed at guards. In this case, Soria said the deputies would open his cell door and allow the other inmate to gas him while he was helpless. They wouldn't allow him to bathe or put on clean clothes for days afterwards, he said. The four deputies -- Justin Linn, Erik McDermott, Stephen Sarcos and Sarah Krause -- were all charged in criminal court last year for their alleged involvement in a series of similar assaults on jail inmates. Their cases are still pending in Alameda County Superior Court; Krause and Sarcos are scheduled for a preliminary hearing next week. Only Linn is charged with assaulting Soria, though all four are named in the lawsuit. An Alameda County sheriff's spokesman did not immediately return a request for comment or to confirm the employment status of the deputies. When they pleaded not guilty to the charges a year ago, three were still employed by the sheriff's office while Sarcos had resigned. "Of all the cases I've had, this is the most despicable and most outrageous in its nature," attorney John Burris, who is representing Soria, said Tuesday. Burris has represented clients in numerous law enforcement misconduct cases throughout California, including the Riders case in Oakland that led to longstanding court-ordered reforms for the Oakland Police Department. The deputies' actions were coordinated and deliberate efforts to dehumanize Soria, he said. "This is worse than spitting on someone," Burris said. "Imagine the horribleness of throwing urine and feces on them for the exact purpose of humiliating them." While the criminal charges are still pending, attorneys with Burris' office filed the lawsuit in U.S. District Court on Monday. DeWitt Lacy, an attorney in Burris's office, expressed frustration today with the pace of the criminal case. "Justice delayed is justice denied," Lacy said. He said they don't consider a criminal conviction a prerequisite for seeking civil damages. The lawsuit alleges that Soria was arrested in August 2016 after he visited John George Psychiatric Pavilion in San Leandro. Employees there tried to sedate him with a shot, but he refused and a struggle ensued, according to the lawsuit. He was booked into Santa Rita Jail in Dublin, at first housed in an isolation cell and then taken to another cell, according to the lawsuit. Court records show that Soria was charged with four counts of misdemeanor battery on an officer, but the charges were dismissed earlier this year. Burris said it was questionable that Soria ever should have been arrested in the first place as he was clearly having a mental health episode and the deputies should have attempted to de-escalate the situation instead of jailing him. While he was jailed, the four deputies allegedly allowed another inmate known as "Preacher" to spray him with urine and feces from a plastic shampoo bottle. After the attacks, the only way Soria could clean himself was with the water from his toilet, according to the suit. He said he once tried to block the door with his mattress, but then had nowhere to sleep except the concrete floor. At one point, the deputies allegedly kicked Soria's cell door closed while his arm was extended through the handcuffing port, breaking Soria's arm. After that, he didn't receive medical attention for a week, despite repeatedly complaining about being injured, according to the suit. Soria showed reporters a long scar on his left arm Tuesday that he said was left by that injury. Another time, McDermott allegedly entered Soria's cell while he was lying down and sprayed mace on his chest and didn't allow him to wash it off. Preacher sprayed the wrong inmate while attempting to target Soria at least once, according to the suit. Another victim identified in criminal court filings told investigators that after he was assaulted under similar circumstances, his attacker apologized and said that he'd intended to spray a different victim with a broken arm. Soria said Tuesday that he doesn't know Preacher and he doesn't know why the deputies targeted him. Charging documents indicate at least six other inmates were assaulted by the same deputies. Linn, 25, faces the most serious charges, including four counts of felony assault by a public officer, one count of dissuading a witness by force or threat and one count of conspiracy to obstruct justice. McDermott, 28, is charged with two counts of assault and one count each of dissuading a witness and conspiracy. Krause, 27, and Sarcos, 31, are each charged with a single count of assault.